HMD Global has been silent in the Indian market this year. Except for the price slash of the Nokia 8, the company hasn’t done anything major. However, that’s going to change next month as the company is going to bring all of its smartphones- the Nokia 1, Nokia 6 (2018), Nokia 7 Plus and Nokia 8 Sirocco to the Indian market. For the unknown, all these phones were unveiled at the MWC 2018 event last month without any tentative Indian launch. A new report now adds that HMD will launch the four Android smartphones next month in the country and have already asked its manufacturing partner Foxconn to ramp the production. 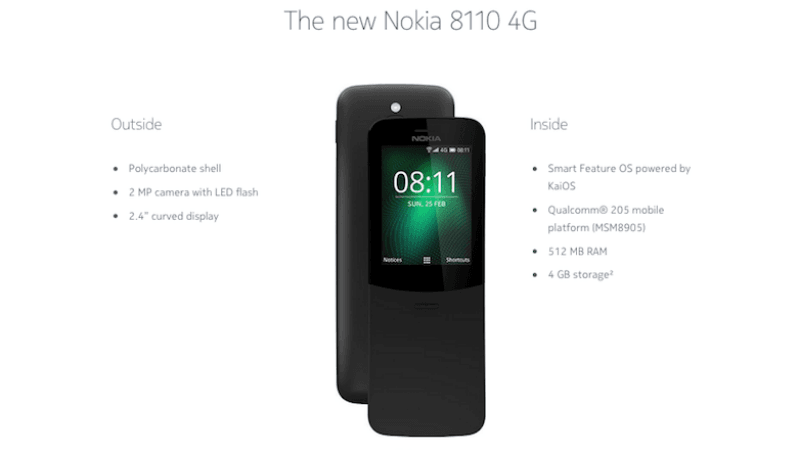 Also, the company confirmed that it would be launching Nokia 8110 4G feature phone in India in May 2018 and that too in collaboration with a telecom operator, so that they can put the device against the Reliance JioPhone. Speaking with Economic Times, Ajey Mehta, country head (India) at HMD Global confirmed that they are in discussions with Foxconn to increase the production of the upcoming as well as existing devices to meet the demand. Furthermore, the HMD Global is looking to get into the top five smartphone brands list by the end of this year, which will be their first milestone since reviving the Nokia brand. CEO Florian Seiche at HMD Global said that the company would be looking for some market share in key markets and India is one amongst the list. And to achieve that, HMD is looking for a strong retail presence. Numbers-wise, HMD Global currently has 510 retail distributors working with them, however, the company is looking to expand the retail presence this year. “For us, the offline channel is a core strength, and it will continue to drive our business. One of the focus areas this year is to increase the visibility at the point of sale,” Mehta said to the publication. With the Nokia 8110 4G feature phone, the company will be targeting the 500 million feature phone users who can not afford a smartphone. And to make the deal lucrative and to put themselves against Reliance Jio, HMD Global will be partnering with a telecom operator, but details about the partnership are unknown at the moment. Furthermore, HMD Global is looking to try out the sub $100 price point and upper mid-range price point in the Indian market, where they feel that there’s a great opportunity. The Nokia 1 could be priced around Rs 5,000 because it can’t go up considering the specs it boasts. The Nokia 6 (2018) could come in around Rs 18,000 as a successor to the Nokia 6, which is retailing for Rs 16,999 (4GB RAM variant). The Nokia 7 Plus is the smartphone everyone’s looking for because it looks stunning, features powerful mid-range hardware and is expected to be priced under Rs 25,000. In China, the Nokia 7 Plus is retailing for 2299 Yuan, which is around Rs 23,500. If it comes to the Indian market for the same price, HMD Global will make the sub Rs 25,000 its own. Lastly, the Nokia 8 Sirocco, which is expected to cost below Rs 40,000. This could be the reason why the company slashed the price of Nokia 8 to Rs 28,999.
where is Nokia 3310 4G ? Not likely to be released in India.